This member of the Solanaceae (Nightshade) family has as bad a reputation as the other members of the family that occur throughout Europe - although one alien species, Thorn Apple Datura stramonium, is naturalised in Europe, having been imported with fertilisers from South America. Atropa belladonna, a bushy perennial plant, growto a height of two metres and occasionally more. The pale green oval leaves are pointed and strongly ribbed, and the bell-like purple-brown flowers with five fused petals, 20 to 30mm long, produce shiny green berries that turn black when fully ripe. 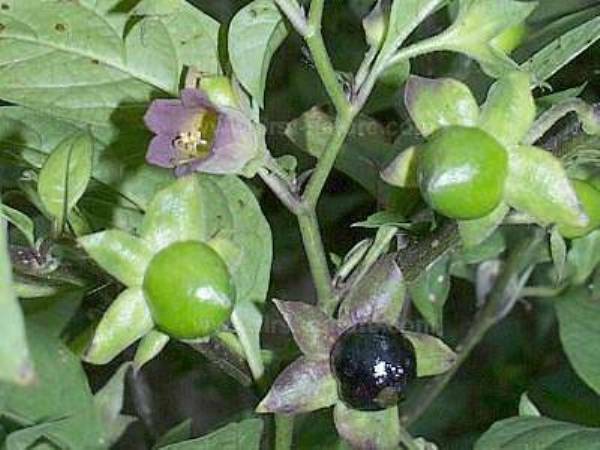 In Britain, Deadly NIghtshade mainly occurs in southern and eastern parts, but it is a rare find. This plant occurs also on mainland Europe and western Asia as well as in northern Africa. 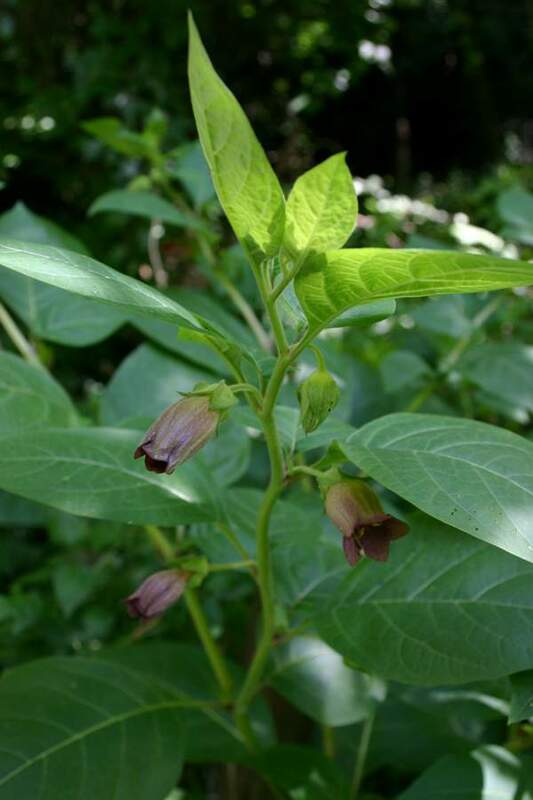 Atropa belladonna is found mainly on lime-rich soil. Solitary specimens are occasionally found growing at the edgeof shaded areas where limestone chippings had been spread a few years earlier. In southern Britain Deadly Nightshade blooms in June, July and August. Although Deadly Nightshade has for manyyears been used as a medicine, the glossy black berries of this plant are a potent poison. Cosmetics were once made from this plant, and some people suggest that belladonna refers to the beneficial effects of facial creams based on this plant. Atropa, the genus name, is thought to be a reference to the Greek goddess Atropos, one of the three 'fates' whose roles were to direct the course of a person's life by weaving threads of destiny. Atropos was the fate who cut the threads to end a life. Given the toxicity of many of the plants in this genus the name seems entirely appropriate. The specific epithet belladonna is derived from Italian and means 'beautiful lady'. This is no fanciful reference to the appearance of the (interesting but otherwise rather dull) flowers of Deadly Nightshade but rather to its effect, when eaten in small quantities, of causing the pupils of a person's eyes to dilate. Women used to risk the other consequences of eating these poisonous plants in order to beautify their eyes in this way. Woody Nightshade or Bittersweet Solanum dulcamara is often, butquite wrongly, misnamed Deadly Nightshade. The Deadly Nightshade plants shown on this page were photographed on a hillside in Hampshire, southern England, in June.